The Smart Gate is probably the Rockman item that has the best reputation amongst the non-Rockman owners. By definition, the Smart Gate has no sound, and is thus independant from the player's tastes and style. There are basically three types of noise reductors. The classic noise-gates suffer from their simplicity, their main default being to completely cut the signal before the end of the notes. The Hush is based on a complex signal processing principle called "adapted filtering" - and on a dedicated chip that performs this function. What Tom Scholz did was to focus on the most critical aspect of this "adapted filtering": in which frequency range do we have noise? Thats how he came to the Smart Gate principle: something simple and efficient that has the same result as more complex noise reduction processors. 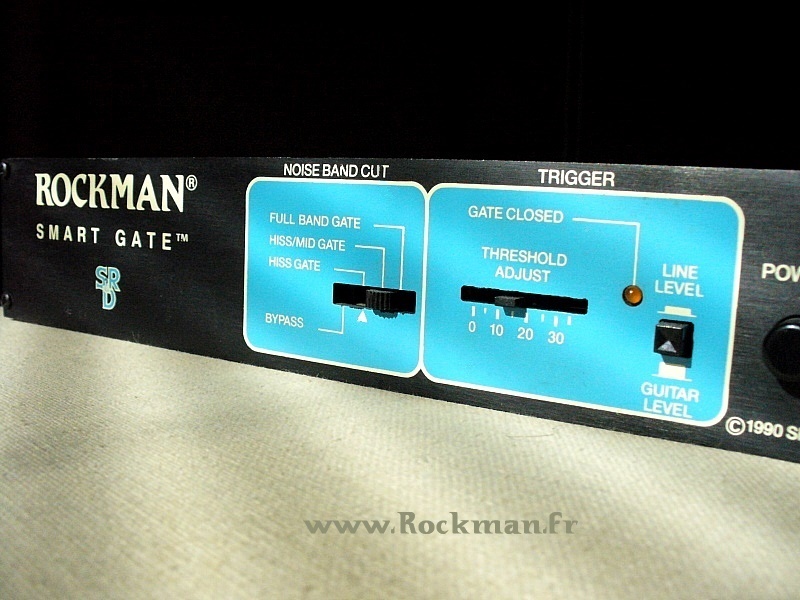 The first Smart Gate was introduced in 1986 as a part of the Rockman Sustainor. This unit has both an input compressor and a distortion stage: the perfect combination to get a lot of noise! Tom Scholz worked on a circuit that would suppress the noise where it is generated: right after the compressor. This choice is weird, in a first approach (we are used to noise reductors that are placed at the end of the chain), but it was after all very smart, cause it leaves the distortion sounds totally unchanged, with all their harmonics. In 1988 and 1989, SR&D issued three more modules - extractions and developments from the Sustainor: the Guitar Compressor, the Distortion Generator and the Smart Gate. While the circuit inside the Sustainor is fairly limited in scope (clear the noise generated by the compressor before the distortion stage), the rack-format Smart Gate was widely expended and is an outstanding general purpose noise-reductor, that can handle any situation. Before describing how the Smart Gate works, let's take a look at what a classic noise gate does. These basic circuits are based on a comparator that turns the signal on or off, above or under a given threshold. The end of the long notes are of course cut, and you must tweak the threshold every time you change sound. That's how Tom Scholz came to the concept of a variable filter that would always let the low frequencies (below 1300Hz) go through, and that would open or close above 1300Hz, depending on the actual input signal. Such a filter is very easy to build: a capacitor, a resistor and a FET can do the job. The complexity of the Smart Gate circuit is not here: we need additional circuits that will detect the presence of high-frequencies, to open immediately the filter every time a new note appears. Then we need another circuit that will control the release time: the filter must be closed proportionnaly to the note decay, so that the gates closes slowly without cutting the end of the notes. That's what you have in the first Smart-Gate, as described in Tom Scholz's patent US 4,809,337. This circuit, after several modifications and improvements, corresponds to the Smart Gate of the Rockman Sustainor. The rack-version of the Smart-Gate is an extension of this circuit. The 1300Hz filter can be set to 1000Hz (Hiss mode), 500Hz (Mid-Hiss mode) or even 20Hz (Full-band mode). Note that in full-band mode, the Smart Gate clears not only the breathing noise in the high frequencies, but also the hum noise that can be present in the low-frequencies. You can at least play with single-coil pick-ups without this unpleasant rumble noise! The original Rockman Smart-Gate is very rare (less than 2000 items!) and accordingly expensive. For those who cannot find one, Bob Cedro has re-created the Smart-gate in a stompbox format, with CMS components, for MXR: all the reviews confirm that this re-issue is as good as the original. A truly innovative and smart unit, based on a simple circuit that has the same efficiency as more complex devices.